If you have not read anything by Elizabeth Strout, you need to start today. She has quickly become one of my favorite writers. I was so disappointed when I missed an opportunity to hear he speak locally. Strout is a master storyteller and has a beautiful way with words. In fact, I feel silly even trying to review her because she is so phenomenal. How do you review someone with a talent like hers? I’ll give it my best shot. I recently had the opportunity to read her upcoming novel, Anything is Possible (which will be released this upcoming Tuesday - April 25th). 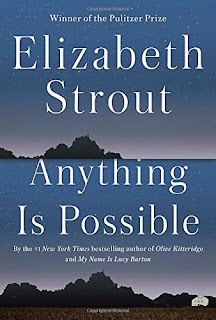 Strout’s newest work picks up with characters readers were introduced to in My Name is Lucy Barton. While there are plenty of overlaps, you can read this new book without having read Lucy Barton. For those unfamiliar with Strout’s works, she writes vignettes of ordinary, everyday people. It may sound boring, but with her eye for detail and character development, it is fascinating. She draws you into these stories in a way that makes you feel like she is pulling back the curtains and peering into homes. These are hidden stories, but they are honest stories. Anything is Possible once again allows readers to see what they wouldn’t normally see behind closed doors. And, since these are ordinary people, it is easy to imagine these are people who live on your street. It is raw and ugly at times, but it is also hopeful and moving. I picked up the book and didn’t put it down until I was finished (and with little kids, that is quite the accomplishment). The title of this book is everything. Thrown back into the town Lucy Barton grew up as a poor child, readers are introduced to several other townspeople. We hear their stories. We learn about their hardships. Most importantly, we see how anything is possible. * I received this book free from NetGalley in exchange for an honest review. * You may purchase a hardcover edition of this book from amazon here. This is an affiliate link. Thank you for supporting my blog!